Two starts into his six-year, $155 million deal, Chicago Cubs starting pitcher Jon Lester looks a little uncomfortable. 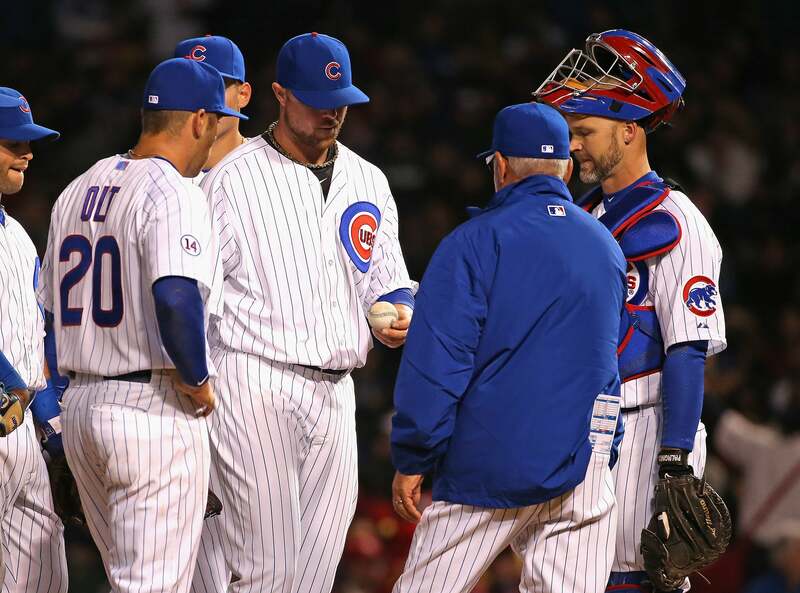 Lester’s issues with throwing to bases took center stage during Monday night’s game at Wrigley Field against the Cincinnati Reds when he attempted his first pickoff throw to first base since the 2013 season. It did not go well. Boston Globe baseball writer Nick Cafardo referred to Lester’s throwing problem as “the yips” in his Sunday Notes column, but quoted Cubs manager Joe Maddon as saying “I think it’s being a little overplayed right now, quite frankly. I don’t want to make this an issue because it’s not for me at all.” Maddon did tell Cafardo that prior to Lester’s Monday night gaffe. Lester’s performance on the mound thus far hasn’t been especially sharp either. In two starts, he’s 0-1 with a 7.84 ERA, a 1.94 WHIP and opponents are batting .383 against him. In addition to the wild pickoff attempt on Monday, he allowed six runs on 10 hits in six innings. Of course, it’s still very, very early, both in this season and Lester’s career as with the Cubs. But that doesn’t make the former Red Sox ace’s struggles any less difficult to ignore.